A baby swing can seem like just one more item on a long list, until your baby arrives and you find yourself pacing back and forth for hours trying to convince her to give up and doze off for a little while. At that point, you realize that a quality baby swing may be the most indispensible of all of the new “stuff” in your now-crowded home. It makes sense, when you think about it; the motion of the swing replicates the safe, soothing motion she grew accustomed to during months in the womb. It’s not a good idea to use a swing in place of a crib or cradle, since too much rocking can make a baby dizzy. But for short periods of time, a good baby swing can let both an infant and an exhausted mom get the breaks they need from the 24 hours a day they spend together. In this list of the top 5 best baby swings, we’ll check out models with different speed, motion and sound options; we won’t go too much into detail on their safety, though, since we wouldn’t dream of listing a “best” baby swing that wasn’t completely safe for the most important person in your life. We’ll also focus on full-sized swings rather than portable ones (although we will mention one portable model for completeness), since most of today’s best baby swings are portable “enough” to be moved from room to room in a house. Before going through our list, you can also check out our Best Baby Swing Buying Guide here. Done? Here we go with our list. A name you know and trust, and a swing that has all of the features you need – at a budget-friendly price of about $130. What’s not to like? We looked at a number of Fisher-Price models for this list, and were tempted by their 4-in-1 Smart Connect Cradle N’ Swing which rocks in three different directions (instead of the two provided by the Snugabunny) and is controllable by an app. We decided, though, that it wasn’t necessary to spend an extra $70 when this terrific baby swing does everything you’ll need. The Snugabunny swings both front-to-back and side-to-side, has adjustable recline and padded head rest, can run at six different speeds (slowly speeding up and slowing down for baby’s comfort), and quite frankly, is the best at calming infants and putting them to sleep. We think that last benefit is because this baby swing’s plush fabric that positions baby deep into the seat is so darn comfortable. Another factor may be that the telltale “baby swing hum” on the Fisher-Price is somewhat louder than some competitors; adults may be annoyed by the hum, but it has exactly the opposite effect on most infants, lulling them to sleep quickly – even more than the included 16 tunes and several nature sounds. There are also three visual distractions, including a mobile with cute toys, a bunny rattle attached to the center crotch strap and a round mirror globe; they can be easily removed to satisfy babies, or parents, who don’t like them. There are some very nice user features on the Snugabunny which aren’t common on most baby swings. 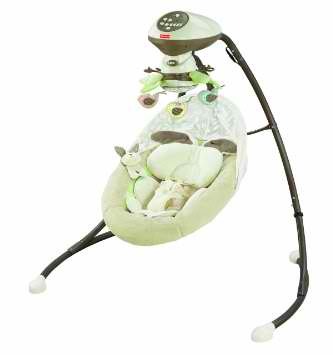 Key among them is that the baby swing can be plugged in, a relief for parents who feel like they’re changing batteries during most of their spare time. (The swing can also run on battery power as well.) The controls are on top of the swing so they’re easy to reach, they’re all push buttons instead of knobs (useful because clicking knobs can wake up babies), and there’s a backlight on the speed buttons (helpful if you’ve turned the lights off to let baby sleep). If controlling a baby swing from your iPod or iPhone is important to you, the 4-in-1 will fit your needs. Otherwise, we think the Fisher-﻿﻿Price ﻿﻿Snugabunny is the best choice. Just about the only things this baby swing won’t do is change a diaper or warm a bottle – and of course, you pay extra for extra features. The price tag is around $240 for this top-end model, which we’ve ranked lower than the Fisher-Price for exactly that reason. If you’re not scared off by the price tag, though, you’ll be getting a whale of a swing. We’ll start with the available motions, which 4moms categorizes by what their nature rather than their direction: car ride, tree swing, rock-a-bye, wave and kangaroo. The company’s goal is to replicate the actual motions that parents use to sooth their baby rather than the traditional motions used by every other baby swing. We can’t validate the scientific reasoning, but the MamaRoo does put babies to sleep, and quickly. There are five different selectable speeds. This swing isn’t without drawbacks. It’s smaller than the competition and modern in appearance, looking almost like a Scandinavian chair instead of a baby swing. However, that makes the comfortable seat shallow instead of deep, so we wouldn’t recommend using this model for older infants. It’s great that the MamaRoo works on AC power, but there’s no battery option so you may be limited in where you can place it. There’s a full LCD control screen with the ability to hook up your own MP3 player to supplement the included nature sounds, but it’s at the base of the swing so you have to kneel down to use it, unless you use the model’s Bluetooth connectivity to control it from your phone – probably a good idea for the sake of convenience. There’s a removable mobile attached. We aren’t convinced you need everything the 4moms model provides, particularly at its price, but it is definitely one terrific baby swing for younger infants. We’ll move from fancy and expensive, to simpler and less expensive – in fact, this baby swing from another well-known and trusted manufacturer is one of the least expensive on our list at just over $100. It also folds down for convenience and takes up less room than the Fisher-Price. There’s just one motion on the Comfy Cove LX, back-and-forth. Even so, it’s a winner when it comes to putting baby to sleep; that may be once again because the hum and creak on this model is noisier (and the speaker produces sound that’s scratchier) than some of the more expensive alternatives, and babies react to sound differently than we do. The comfort for baby is terrific, with a deep, plush reclining seat as well as added body support and a removable headrest. The controls are push-button, and easy to reach toward the top of the swing. The one real negative we found is that this isn’t as sturdy as most of the other top 5 best baby swings we’ve listed, probably because it’s built to fold for easy movement. Even so, we never felt there was a safety issue with this model. We would have ranked this Graco higher if it had more than one motion and was a little stronger, but it’s still a great value and will let you save some money for all of the other “stuff” on your baby furniture and equipment list. One note: the LX runs on batteries but there’s also a DLX model which can run on either AC and battery power, which might be worth paying a little more if the swing will be remaining near an outlet. This “all-natural” baby swing has become a trendy choice for many parents, even though it’s far from the traditional type of swing most of us grew up with. To begin with, there’s no motor, no AC power, no batteries and no controls, because it’s designed to resemble the natural environment of the womb with gentle swinging created by either a parent’s light push or the baby’s body motions. There are also no harnesses to hold the infant in place (again, for a more natural feel). Instead, the construction of this baby swing is very similar to a hammock with netted sides. There’s no way that the child will fall out, but she’s also not restricted and is free to wiggle or bounce. Surprisingly, that doesn’t mean that babies stay awake and play when placed in the Cocoon Swing; they’ll fall asleep as easily as when placed in a more modern powered swing. Here’s the portable swing we mentioned at the top, although it’s study enough that many will just it set up in one place and leave it there. At $60 it’s a very good bargain for that purpose, but there’s one important condition: it’s only meant for babies under the age of six months who weigh between six and 20 pounds. In other words, don’t expect this to be the only swing you purchase over the course of your child’s development. The Cozy Kingdom sits low to the ground, so you may have to bend over to reach the knob controls for the six speeds and six songs – and of course, you’ll have to get onto your knees to put baby in and out of the swing. The seat has plenty of padding and a removable headrest so it’s comfortable for a young infant, but the construction (as you’d expect) isn’t as sturdy as the larger, more substantial models on our list. There’s a recline function which isn’t terrific. Even if there weren’t weight and age limitations specified by the manufacturer, we still wouldn’t use this swing for a larger baby. However, this is a very quiet baby swing (which for some infants will be a positive and for others will be a negative), it folds and carries very easily, and has a removable toy bar in baby’s vision. It’s nothing extraordinary, but it’s a good choice if you’re on the go a lot and need a decent baby swing to take with you and your smaller infant.